Since it is almost summer I thought I do a blog about summer projects to sew. Fold the beach towel in half lengthwise. Measure the distance from end to end. Add 1" to this measurement for 1/2" seam allowances. This is measurement A. Fold the towel in half, in half again and in half again. Measure the distance around the towel. Add 5 inches to this measurement to allow for the fold over and hems. This is now measurement B. Cut a rectangle of fabric to be measurement A by Measurement B. Hem each end of the rectangle along measurement B by folding under 1/4" and under 1/4" again. Then top Stitch the hem into place. Refer back to the original measurement you took around the folded towel (before adding 5") and divide it in half. Bring a hemmed edge up that measurement, right sides together. Stitch the seams using a 1/2" seam allowance. Separate the seam allowance and make another 1/4" hem on the sides of each flap. Turn the fabric right sides out. Place the folded towel inside the bag, lining up the edge of the towel with the edge of the bag, as shown in the picture. Stitch the edge of the towel to the shorter edge of the bag, the same way it lined up while folded in the bag, lining up the edges of the bag and the edge of the towel. Stitch near the edge and then again 1/4" away from the first line of stitching. Place the hook tape centered on the inside of the flap. Stitch around the edges of the tape to hold it in place. Fold the flap over as if you were closing the bag. Fold the hook tape back and line up the loop tape on the bag body. Pin it in to place. Remove the towel from the bag and sew the loop tape in to place. Re-fold the towel and place it in the bag. Close the hook and loop closure. Materials: 5XL (or very large) shirt, Pins, Scissors, Sewing Machine, and Thread. Turn the 5XL shirt inside out and lay your fitted t-shirt on top of it. OPTIONAL: pin out about 3/4-1 inch on each side using safety pins. This makes it so you can turn it right side out and try it on to make sure it will fit right. Remember if you did not pre-wash the shirt it will probably shrink a bit. Once you know where you want the seam pin with straight pins continued the flare of the fitted shirt all the way to the bottom so the skirt would be a short A line. Trim off the excess material from the sides. Seams lined up with the shoulder seams on the large shirt so if I cut it off right on the seam it would have been a cap sleeve. You want the sleeves a tad longer; so, just left about an inch outside the seam. Sew along the pins and stop when you get to the sleeve seams to finish the sides for a plain t-shirt dress. Use strips of the excess material to form your ruffle. Use 4 strips about 3 1/2-4 inches wide and 13 inches long. You can sew all four strips together for one long strip or do two at a time to make it easier. Sew a loose stitch all along one edge of the strip about 1/2 inch from the edge leaving strings on each end. Pull one of the strings, holding the other in place to gather the fabric. Pin the gathered strips on to the skirt. You will end up with seams on the right and left sides and in the middle of the front and the back; but, they are not visible because of the gathering. Sew a straight stitch right down the line where you gathered to attach the ruffle. 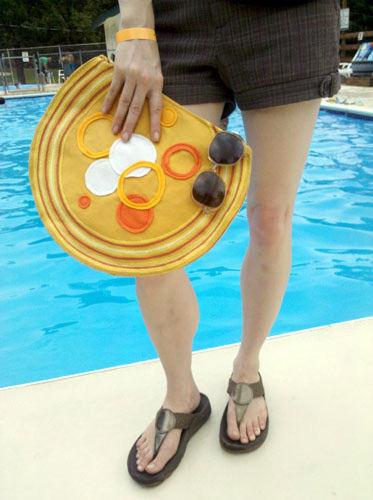 Use two round place-mats to make this cute beachy bag. First off, decide what kind of design you would like on your beach bag. I went with some mod circles, so all I needed for my stencil was a drinking glass. You can use store-bought stencils, but keep in mind that more complicated designs will take longer to stitch to the place-mat. Use chalk or a fabric marker to trace your designs. Chalk will brush off, and fabric marker won't leak into the wash. Arrange your felt pieces on what will be the front of your place-mat. Of course, you can always decorate both sides of the place-mat if you wish. Using a sewing machine, or even hand stitching, carefully attach the felt pieces to your bag. If you are not much of a seamstress, you can use iron-on paper (found at most craft stores) and simply iron-on the felt. Decide where the top opening of your bag will be. It can be as large or small as you like. I made mine big enough to shove my hand, flip flops and maybe a good romance novel in there. Mark each side of this opening on the place-mat that will be the front of your bag. Lay the two place-mats on top of each other, right-side out. Stitch all around the place-mats to the other opening mark, staying about 1/4" from the edge. Fold in the two flaps of the opening. If there is a cool color on the inside of your place-mats, you can fold these out instead to add some contrast to the bag. Stitch the flaps in place so that you have a flat top to your beach bag. Or don't...and keep a perfectly round bag, it's up to you! At this point, you can stitch on a strap to each side of the opening. Easy straps can be made out of braided shoestrings, ribbon, even neck ties.